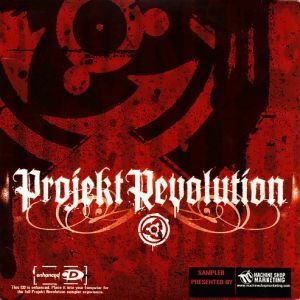 Projekt Revolution Sampler is a compilation album released to promote the Projekt Revolution Tour in 2004. Because the Projekt Revolution Tour is about bringing together different styles of music, the sampler is comprised of audio tracks from 13 distinctive artists and is a mix of various genres of music from rock to hip hop to punk. The 2004 Projekt Revolution Tour kicked off in Cincinnati, OH on July 23rd and hit 32 cities before concluding September 5th in Mountain View, CA. News of the sampler came after an announcement about the “Revolution Village” (a series of interactive exhibits from the tour’s event partners) and the line-up for the Revolution Stage (Ghostface, Funeral For A Friend, M.O.P. and downset, along with No Warning, Instruction, Autopilot Off, who joined on for small regional stints). These bands joined Linkin Park, Korn and Snoop Dogg who headlined the main stage along with The Used and Less Than Jake. The live tracks were exclusive to the album at the time of their release, but they eventually appeared in other releases by Linkin Park and Korn. "Breaking The Habit" (in a slightly different edit) was released later that year in the LP Underground 4.0 CD and "Did My Time" was released in the Greatest Hits, Vol. 1 bonus DVD. It was only in 2006 that the track was released in audio format as part of the Live & Rare compilation. The other songs on the sampler are mostly album tracks with a couple of exceptions. "The Heart Of Polka Is Still Beating" is a b-side on the "Anthem Of Our Dying Day" and "Until The Day I Die" singles by Story Of The Year; and "Fool'n Yaself" is an exclusive song recorded by Snoop Dogg for the sampler. The rapper made a rock song because he felt like he was accepted into the rock world as part of the tour. A music video was shot for the song which was expected to be released as a single and to appear as a bonus track on his next album, but the release never happened. The Jadakiss song "Shoot Outs" is mislabeled as "Shoot Out" on the sampler. Linkin Park offered everyone who purchased a ticket to any of the 32 tour dates on 2004's Projekt Revolution Tour a free sampler download. The sampler included audio tracks and enhanced content from 13 different artists, some featured on the tour, some new and upcoming bands, and some offering exclusive live or rare tracks. Projekt Revolution ticket-holders could head over to www.Prsampler.com or LinkinPark.com and enter a special code printed on their physical tickets to gain access to the download. The sampler downloaded in the form of a player, with all of the audio embedded. Enhanced content included band bios, links, photos, and video content. Physical copies of the mixtape were also available at the Machine Shop booth during the shows. The sampler CD comes in a cardboard slipcase and features 19 tracks.